There are so many old-fashioned garden wisdoms passed along through generations but which ones actually work? I’ll walk you through some examples and you can see if they seem right to you. Also see, popular garden wives’ tales for the garden. The Garden Knows. How Could It Not? As I’ve matured as a gardener, I’ve become much more aware of all the signs and signals nature provides which can then, in turn, be used as prompts for certain actions. You’ll see what I mean with the examples provided below. And what could provide better gardening tips than nature itself? This is known as phenology—the observation of natural events through the season. You can read more here with examples on how you can use it to improve your garden. How Did Gardeners 150 Years Ago Know What to Do? Before there were readily-available gardening books, magazines, or the internet, I’m sure it was not easy to obtain helpful gardening advice—or reliable plants or seeds. 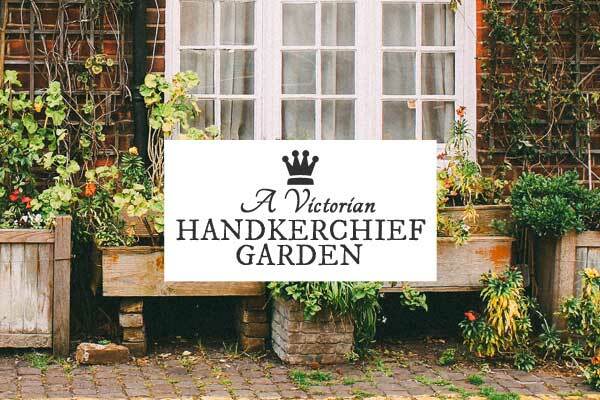 Depending on the era, this may have been left to word-of-mouth (right or wrong), gardening clubs, farmers, and perhaps some tips provided in seed catalogues. Right or wrong, gardeners and food growers had to draw conclusions from what they witnessed or heard by word of mouth. It’s messy to confuse correlation with cause, but with little else to go by, people did they best they could to ensure their crops would thrive or, at least, survive, and any apparent keys to success were passed along. Today we know that most gardening advice is both regional, climate, and weather specific. There are basic needs for plants (soil, water, sunlight, air), but what thrives in your climate may not grow in mine. And our timing may be completely different. That said, I love hearing the old garden wisdoms. They are particularly sweet when they come from keen observations that prove true today. Where I live (Ontario, Canada), the daffodils usually bloom in late April. This means there has been enough light and constant warmth to coax those blooms open. Once those yellow flowers appear, I know the soil is warm enough to plant the first peas. Soon after I start other early crops including cabbage, carrots, lettuces, onions, parsnips, radishes, squash, and turnips. We may be cursed by a late spring snowstorm, but if we all waited until it was safe, we wouldn’t have enough time to grow anything at all. 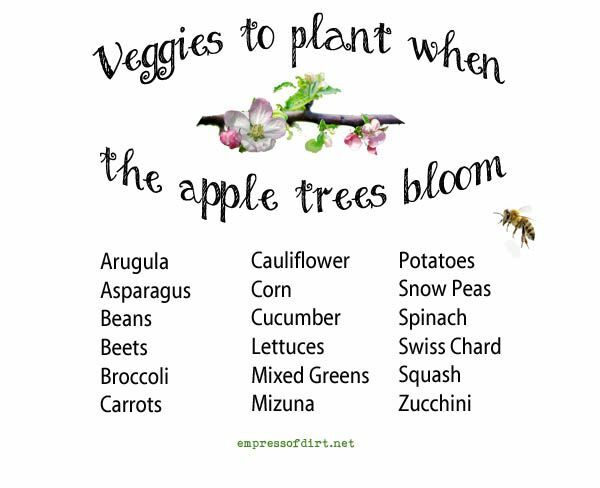 In May, when the apple buds plump up and the blossoms start to pop open, conditions are right for the next group (and some succession plantings) of veggies. This includes arugula, asparagus, beans, beets, broccoli, carrots, cauliflower, corn, cucumbers, lettuces, mixed greens, mizuna, potatoes, snow peas, spinach, swiss chard, squash, zucchini. 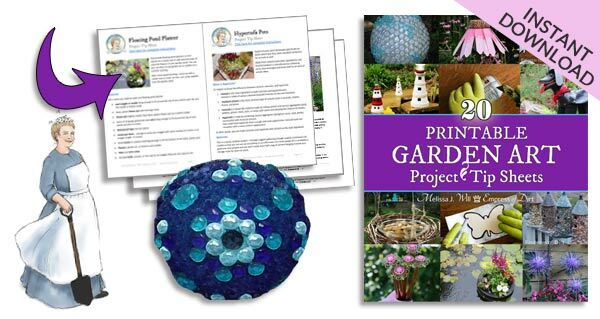 When is the spring garden ready for sowing? Grab a handful of soil. If it’s cold to touch, it’s not ready. Comfortable to hold, it’s time to sow. This is a simple way of checking soil temperatures. Each type of plant has optimum soil temperatures for germination and they are all different. I have notes here if you would like more information for popular veggies. 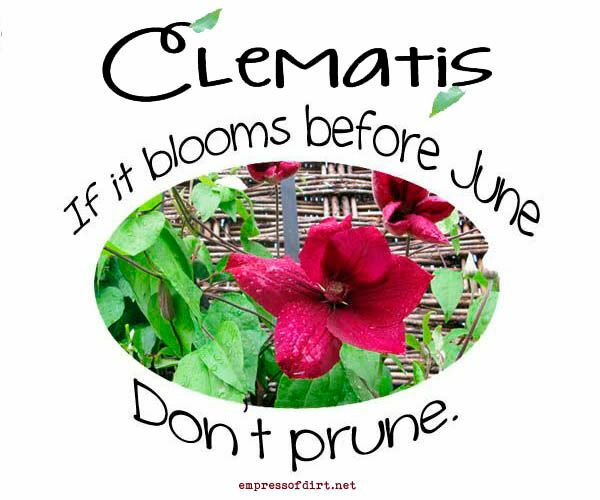 When you don’t know what type of clematis you have, that plant’s own blooming time can help guide you to the right pruning time. If it blooms before June, don’t prune! In other words, don’t clip off forming flower buds in late spring if you know that’s when it flowers. Wait until the plant has finished blooming to tidy it up. Dare I say, it’s just common sense if your goal is flowers, flowers, flowers. 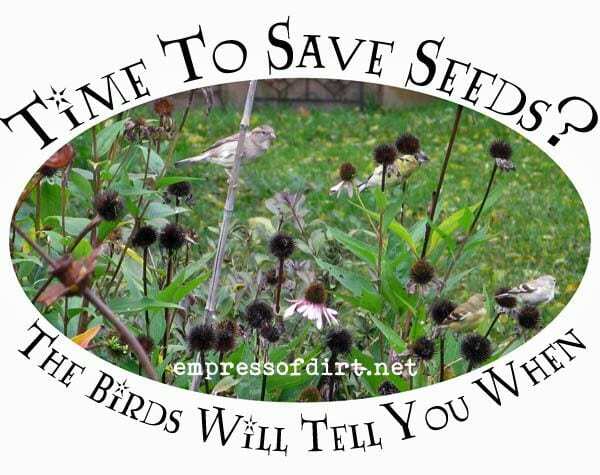 Seed saving can seem daunting to the new gardener. How and when to do it? The birds will tell you when. Watch as your flowers fade and seeds form. The birds go for the dry, toasty, delicious seeds. I watch for their pick of the day, get a container and some scissors, and clip off those flower heads. The seeds are kept in a cool, dry place indoors, ready for planting in the spring. 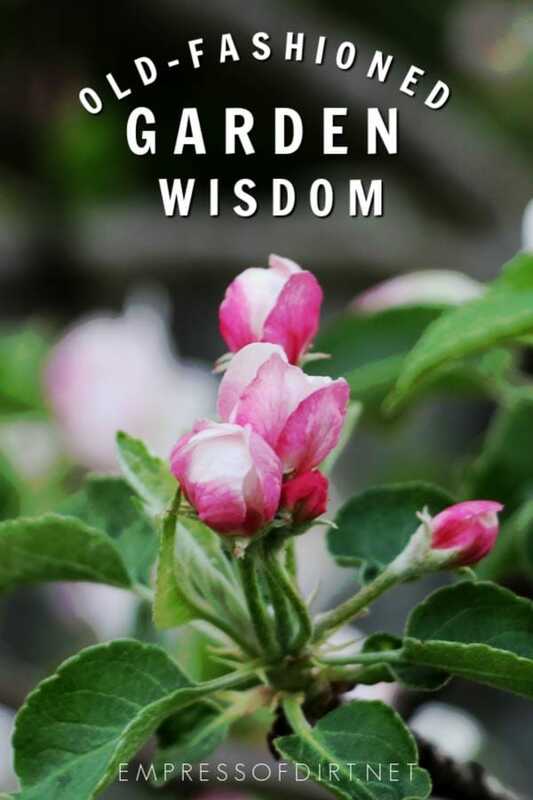 One more favourite garden wisdom is a gardening book written in the 1880s by Charles Barnard. Charles was an urban farmer who recognized how much food he could grow for his family on a small, city lot. His book encourages this practice and shares tips for success. You can get the ebook and read more about Charles here. It’s seems the urban food growing trend is not so new after all. What cues to you take from the garden? Learn more about the art and science of phenology here. Garden wisdoms are so often location related! Here in the Bay Area of California, we have a Mediterranean climate, and we plant our peas in October, and the Daffodils bloom in February. My Wisconsin gardening Grandma told me “Corn should be knee high by the 4th of July”, and a friend from Ireland said to “Plant potatoes on St. Patrick’s Day”. Neither really works for me. . .! I love your newsletters.Our weather has been a little crazy this year and it has been hard to know when and what to do sometimes .We have a large yard and I think I need to plant something all over.We have a large amount of deer and they will destroy a lot of plants.I have learned over time what to plant.I really enjoy your messages. Thanks,I loved reading these besides they were very informative. Have a great weekend. I have not heard some of your natural mother nature to help me but just when to plant is exactly what I relate to in less than a little reading. I was raised outside Regina, Saskatchewan. this is like hearing those saying when I was young but have not heard them since over 50 years ago. Makes sense. I basically have done more gardening majorly in Missouri on the farm. Interesting and I will explore more later. Interesting tips! I mark them! Thank you! From nature’s lips to my ears. lol.